With a series of major moves this week, President Barack Obama and Secretary John Kerry are announcing a handful of initiatives to protect and preserve oceans, coasts, wildlife, and habitat. We’re pleased to see efforts to support marine spatial planning such as the Blue Plan, protect the critical habitat fish & wildlife need to thrive, combat illegal fishing, and improve resiliency in our vulnerable coastal communities. Please read the following White House press release for more information on these and other goals. 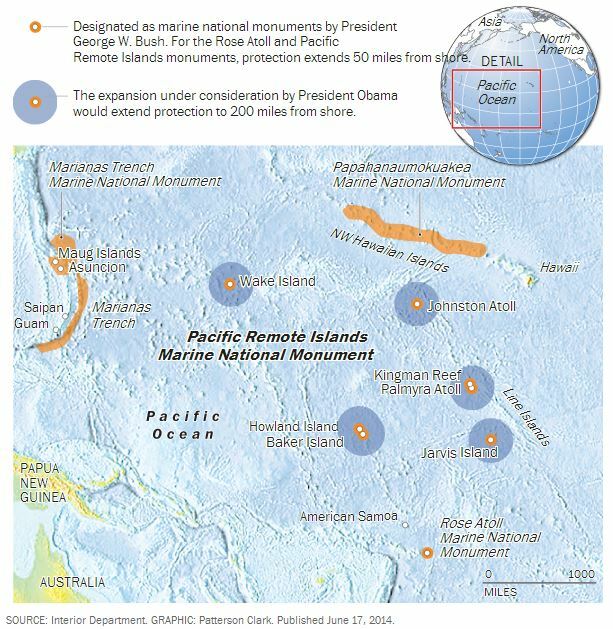 President Barack Obama is proposing an expansion of the Pacific Remote Islands Marine National Monument to 782,000 square miles. Alaska & Texas combine to cover 854,000 square miles. Mexico covers 758,000. This week, the State Department is hosting the “Our Ocean” conference, an international conference on sustainable fisheries, marine pollution, and ocean acidification that concludes today. Secretary Kerry has also issued a global call to action to protect the oceans. As part of the conference, the President is announcing several steps that the United States is taking to answer that call. $102 million to build resilience in coastal communities. Yesterday, the Department of the Interior announced$102 million in competitive grants funding science-based solutions to restore flood plains and natural barriers, such as marshes and wetlands along the Atlantic Coast. The funded projects will help deliver on the Administration’s Climate Action Plan commitment to make local communities more resilient against future storms. For more information on the Our Ocean conference, visit http://www.state.gov/. For more information on the President’s National Ocean Policy, visit http://www.whitehouse.gov/administration/eop/oceans.